ABSOLUTELY BEAUTIFUL HOME in a serene setting with GORGEOUS LAKE VIEWS. 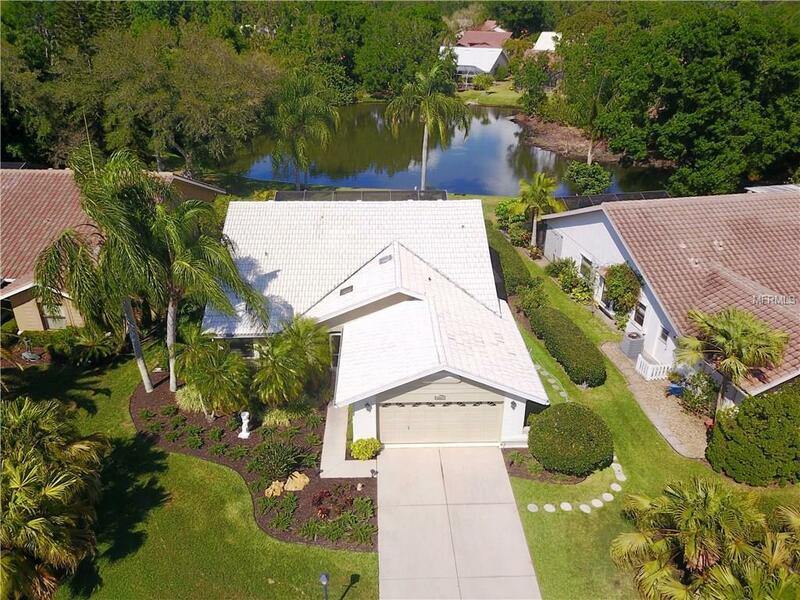 This home is in an ideal, centralized location just minutes to UTC mall, Wholefoods, Fresh market, restaurants, Downtown Sarasota, Lido Key and Siesta Beach. IT HAS BEEN IMMACULATELY MAINTAINED AND IS MOVE IN READY. Features an excellent lay out, very open with a lot of natural light. Has a pretty entrance with tropical landscaping and a screened front door that you can leave open on those breezy Florida days. The bedrooms are on a split plan allowing privacy for you and your guests. The master suite overlooks pool and lake which can be accessed through glass sliders. The master bath has been nicely updated. The den is just off of the living room featuring a dry bar, could easily be used as a 3rd bedroom or guest room by converting dry bar back to a closet. The great room has volume ceilings, glass sliders, updated wood floors and a gorgeous lake view. Enjoy entertaining friends and family under the large covered lanai or take a dip in the pool and soak up some Florida sun. Many updates throughout, such as pool re-surfaced, new Dream Deck, new AC, updated bathrooms, new kitchen cabinets, 4 new kitchen windows, new glass front door, natural wood floors, new garage floor epoxy surface, and fresh paint throughout. Call to book your private viewing today!